What will happen to my application to join the YouTube Partner Program if it's currently pending? 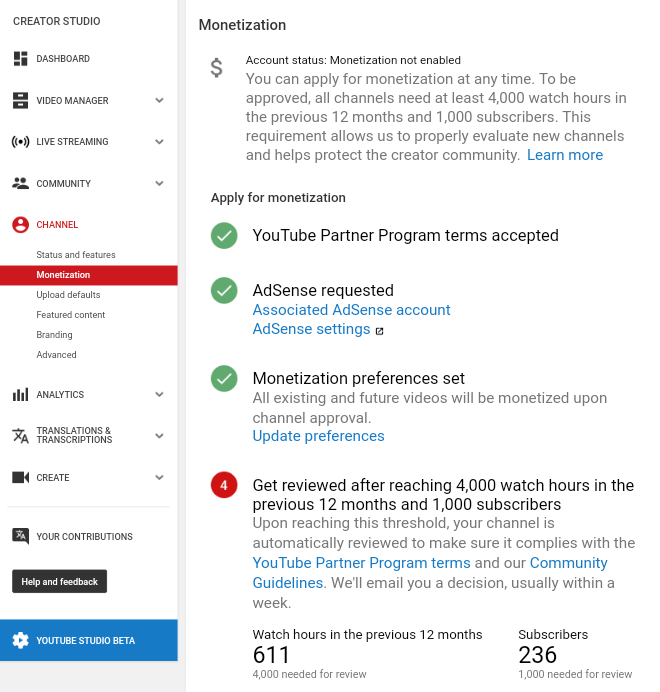 I'm part of the YouTube Partner Program but I don't meet the requirements, will my monetization be removed? If you are already part of the YPP, these requirements apply as well. You will have to meet these requirements until February 20, 2018, or ads will stop running on your videos, and you will be removed from the YPP. But don't worry if you are not able to meet the requirements, you can re-apply to the program again 30 days after suspension. If until this date your channel meets the requirements, YouTube will automatically re-evaluate your channel for YPP. If you're a Freedom! partner but you are not sure what the problem is, get in touch with our support team so we can help review your content and the potential issues that lead to this problem. We are always ready to help. My channel was unlinked from Freedom! by YouTube on February 20. Can I still continue to use the Freedom! music libraries? Freedom! partners that were unlinked by YouTube on February 20, still have access to the Music Factory, AudioMicro, Uzer Music and Epidemic Sound libraries, as they did before that date. However, if you are no longer a partner with Freedom!, any new videos that you create that use assets from these libraries may get monetization claims. But don't worry because these claims will not turn into strikes or affect your channel in a negative way. If you have any questions or concerns, please contact our support team by clicking the "Submit a request" link at the top of this page, or by clicking here. Our team will be happy to answer any questions or concerns you may have. Why am I required to join the YouTube Partner Program? Where is the YouTube Partner Program available? What are the alternative partnerships if I am unable to join the YouTube Partner Program?